In the western Christian tradition, Epiphany is celebrated on January 6. Although this is not a day that I personally observe, on our recent trip to Mexico I was interested to learn about the Mexican Epiphany, Día de Los Tres Reyes Magos (Three Wise Kings Day), when the Kings are said to have arrived bearing gifts for the baby Jesus. This day is the traditional day of gift exchanging, and it’s not Santa but the Three Kings who leave presents for the children in the night. 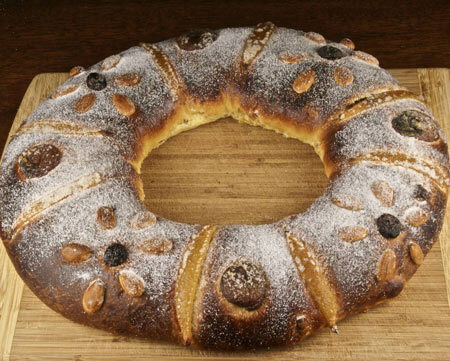 Rosca de Reyes is the sweet ring bread that is enjoyed during this time. According to custom, a small porcelain baby Jesus is baked into the bread, and whoever gets the doll in his or her piece must host a party on February 2, Candelaria Day. According to Diana Kennedy, from whose book The Art of Mexican Cooking I adapted this recipe, candied fruits in and on the ring are optional, and most often include figs, orange peel, and citron peel. I didn’t have any of those on hand, but I did have some candied lemon peel, dried apricots, and golden raisins, which I soaked in hot water before adding to the dough. For the top I used strips of candied lemon peel, dried apricot halves and dried cherries, all soaked, as well as some blanched almonds. The result is somewhat more rustic looking than the breads adorned with bright red candied cherries and green citron peel, but I like to think it’s just as delicious. Oh, and since I also didn’t have any porcelain babies on hand, I tucked a dried bean into each loaf. Discovery of the lucky winners is pending. In the bowl of a stand mixer with a dough hook, combine all of the starter ingredients. Mix until the dough forms a smooth elastic mass around the dough hook. For me this took about 10 minutes. Remove the dough hook, cover the mixing bowl, and allow the starter to ferment until doubled, about 2 hours. To the fermented starter in the mixing bowl add the final dough flour, egg yolks, water, orange zest, and about half the sugar. Mix with the dough hook on low speed until combined, about 4 minutes. Don’t be alarmed if the dough is rather stiff. Turn the mixer to medium speed and gradually add the rest of the sugar. Continue mixing until the dough reaches almost full gluten development. The dough will be quite sticky. Add the butter and mix in low speed for a minute or two, then in medium speed until the butter is fully incorporated into the dough. Turn the mixer back to low speed and add the fruit. Mix until just incorporated. Transfer the dough to a lightly oiled container. Cover and ferment for 1.5 hours at room temperature. Turn the dough into a lightly floured counter. Divide it in two pieces. Shape each piece into a tight ball and let rest, covered, for 20 minutes. For each loaf, poke a hole in the center of the ball. Using floured hands, gently stretch the dough into a ring shape and lay it onto a prepared baking sheet. Before baking, decorate the top with fruit and brush the dough and fruit lightly but thoroughly with egg yolk. Bake for 15 minutes, until browned. 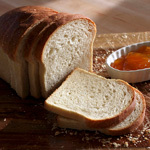 Remove the loaf from oven, brush with melted butter, sprinkle with sugar, and return to the oven for another 5 – 8 minutes. The internal temperature should be at least 190F. I read about this too in a book. 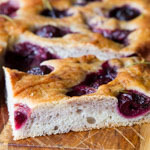 Your unbaked bread dough looks so pretty – I would not have had the heart to put it in the oven:) I agree that even without any candied cherries the rustic bread looks great! Probably the Spaniards brought the tradition to Mexico, because also here the Reyes Magos bring the gifts. This looks fabulous! And I’ll take “rustic” over artificially colored any day. Susan, this is beautiful. I’m digging all I’m learning from you about Mexico and food. Susan dear, this look so beautiful. Guess what, I made the same bread using the same recipe from Diana (really adore her). Did you have great vacation in Mexico? Another beautiful bread, as usual! You keep me inspired. How beautiful! And portioned out as well, I call a big section! I have that book on my shelves, I really should take a better look at it. What a good idea to soak the dried fruits – unfortunately mine were burnt after baking. Happy New Year! What a beautiful looking bread. I love the way you decorated this. I was talking to my coworkers about this bread a couple of weeks ago. They were regaling me with stories of people who were suspected of either hiding the baby Jesus so that they wouldn’t have to host the party or people who accidentally swallowed the baby Jesus. I’m sure this is probably blasphemous but we were all laughing our tushes off!! Your bread is gorgeous as usual! Susan, your cake recipe comes to me at just the right time. I’ve been suffering holiday withdrawl and needing a bit of ‘mischief’. Just yesterday I reminded myself that Mardis Gras sits upon the horizon, and with it, the opportunity for me to contribute once again to hubbies office party. I baked my very first King Cake last year, hidden baby included! This is the perfect item to use for this years creation. I can decorate one in the usual green, purple and gold icing sugars, the other with fruit and nuts. I’ve got extra babies, but should I tease them and only use one? lol. I don’t know if I could ever eat any of your breads…they all just look like a work of art. I would hang them like wreaths in my house. Gorgeous rosca! It would break my heart to cut into this. It’s a work of art. What a beautiful ring, Susan! And I love that the three kings rather than Santa bring the presents. I wouldn’t have thought of soaking the outside decorative fruits either and would have ended up with burned decoration. You are brilliant. Wow, you truly do make some beautiful breads! Absolutely beautiful. I really enjoy the rustic flair! By the way, great idea in regards to soaking the fruit ahead of time. I think I’ll use that technique for my bran muffins with raisins. The top raisins always char. The loaf is beautiful and I really like your nativity pieces. I bet the bean is a lot safer to chomp into than porcelain. Most likely from the French who brought bakers to Mexico during the time of Maximilian, a pretender Hapsburg who Napoleon III installed as emperor of Mexico during our own civil war. This also is big in France and Switzerland, very Latin. Looks delicious like everything you make Susan! Your Rosca De Reyes is really beautiful! A delicious treat! Thank you for sharing the recipe and photos of the beautfuil bread.Do you know of a great English Mexican recipe book that teaches you how to make mexican breads and pastries? Tanya, I don’t have any books specifically devoted to Mexican baking. The Art of Mexican Cooking by Diana Kennedy, from which this recipe is adapted, does have a short chapter on Mexican breads. I am Mexican living in the US. I have used your recipes for “Dia de Muertos bread” and “Rosca de Reyes”. Both are great, thank you!!!! The taste and texture are exactly as I think they have to be. Your decorations are beautiful. You should also try decorating the “Rosca de Reyes ” with thick flat strips of a mixture of flour, sugar and butter, that is very traditional and tasty. I have never heard of this tradition, I love it and what you did with bread is beautiful! Because it looks rustic it seem like it should taste like amaretto. Would that be ‘against the rules’ if that flavor was added, or should I stick with the original recipe to keep it traditional? Thanks so much for sharing! Nikki, others may disagree, but i think it’s never wrong to use tradition as a starting point for something new and different. Sorry,but I may say that the authentic recipe it´s from Spain and it´s called “Roscón de Reyes”.The mexican recipe it´s a copy 😉 much better the spanish hehehe. That’s not a Mexican tradition, it’s a spanish tradition, and is: Roscón de Reyes, not Rosca de Reyes. Remember to put cream in the middle, and hide the surprise! Thank you for posting. Going to try it with my mom. To the dweebs, it may be one thing in Spain. It doesn’t mean the Mexicans haven’t made it there own, different name and all. To the dweebs, it may be one thing in Spain. It doesn’t mean the Mexicans haven’t made it their own, different name and all. I’m a mexican resident of the USA since 2003. I just want to say how much I appreciate this article. Thank you! It is not exclusive from one country, I’m a 42 yrs old mexican woman and I grew up celebrating the Epiphany, Kings day and of course eating Rosca de Reyes and hot chocolate. Thanks for posting this recipe! I have made this Rosca several times before and it always came out tasting and looking authentic (I am from Mexico City)! It’s the best recipe I’ve found out there. I do put the strip of sugar/flour/butter -that a previous poster mentions- many times around the Rosca. I prefer it than candied fruits. This is a great holiday bread shaped in a wreath. So fun to eat with the family. I stumble upon your blog looking for a good Panettone recipe and found you have excellent recipes of three of my most cherished breads when I was growing up as I was born and raised in Mexico City: Pan de Muerto, Rosca de Reyes, and Conchas. 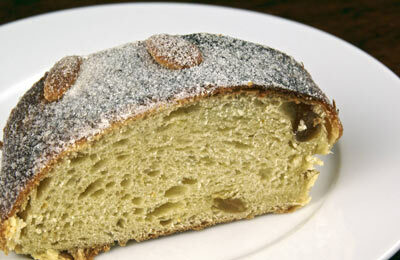 So, instead of Panettone I am now getting ready to try your Rosca de Reyes recipe for the coming celebration. I went and read the comments here just to not repeat what others have said and found some that need response. Yes, Mexico was for many years a colony of Spain and as such my ancestors took traditions from Spanish cuisine and made them theirs modifying them with their experiences (see that I write modifying instead of improving). 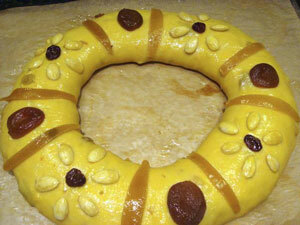 So, yes the Rosca de Reyes is a derivation of the Roscón from Spain. Sorry, I don’t think that Maximilian of Hapsburg and his French chefs had anything to do with this tradition. So, which one of the two breads is best? My answer to this is, it really depends on the cook not the recipe. You have made some modifications on recipes of other well-know chefs as you kindly report at the beginning of your recipes. We are not faulting you (at least I am not) but thanking you (at least I am) that you are adding your knowledge and experience to the recipe. More in this respect is the fact that Spain was under Arab control for many years and this fact affected Spain’s cuisine. Are the original Arab dishes better than the Spanish dishes? Not necessarily. Anyway, the reason to send this comment is to add a little of what I remember was the lore related to the Rosca de Reyes. First, is to agree with Lourdes Villasana, who wrote that original Roscas she remembered had a mixture of flour and sugar as part of their toppings. This is the same garnish used for the conchas that you have already described. Second, the story of the little porcelain figurine of “baby Jesus” is more involved. 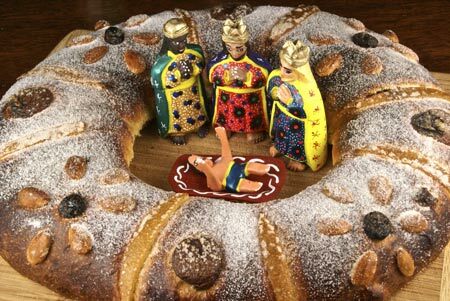 The host family of the party of January 5th presents to their guests the Rosca de Reyes and one of those guests gets the hidden “baby Jesus”. The family of this guest is now the “protector” of “baby Jesus” until he is presented to the priests at the Temple on February 2. The “protector” family takes the baby Jesus figurine from the manger (like the one you have in the photo of your final Rosca) of the host family. The “protector” family has to dress the baby up. There were people in my country (or maybe there are still but they are a dying breed) that sold their services to “dress up baby Jesus” making beautiful lacy garments for the baby figurine. Then the hosts of the January 5th party goes with the protector family of the “baby Jesus” to church on February 2nd and presents the “dressed-up baby” at the temple. The “baby” is then blessed and the protector family members become godparents of the “baby Jesus” of the host family. This new family bond is then celebrated with a party on February 2nd at the “protector” family’s house serving tamales and atole. Two of the most savory Mexican dishes (from the Aztec cuisine) ever served. My son’s fiancée is from Tijuana and she brought an Epiphany bread from a bake shop there. 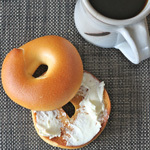 It had a sweet, cream cheese type of filling. Do you have a recipe for something like that? Your recipe seems like it is an unfilled type of bread.